Very nice Top! Thank you very much! Wonderful! Love that the Top matches the skirt. You think of everything! It's marvelous!! VERY nice vest; thank you so much! And an extra 'Thank you' for the wonderful bonus textures - they are very helpful! Thanks so much for your clothes. Some of us don't do all that fantasy and midevil garbage with swords bigger than the character...lol. You are keeping it real and I love you for it. Now....how about a real nice set of high heel shoes for a business suit for her. They are getting so hard to find. Black and red and white will do...haha. Thanks again dear. Wow, this is super cute, and so many possibilities! Thanks again for another wonderful piece of clothing! 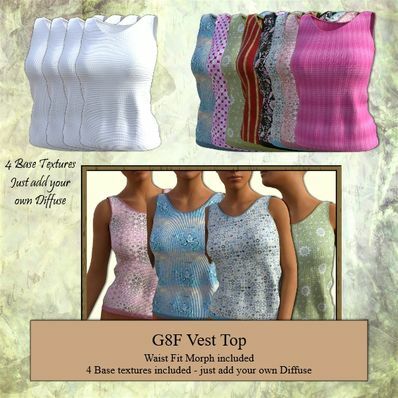 Thanks Wendy for creating & sharing these colourful vests for the latest Daz figures. Thank you very much! You are so generous!